The Lancaster Changing Table from Delta Children offers a secure place to change and dress your baby, plus two shelves for storage. 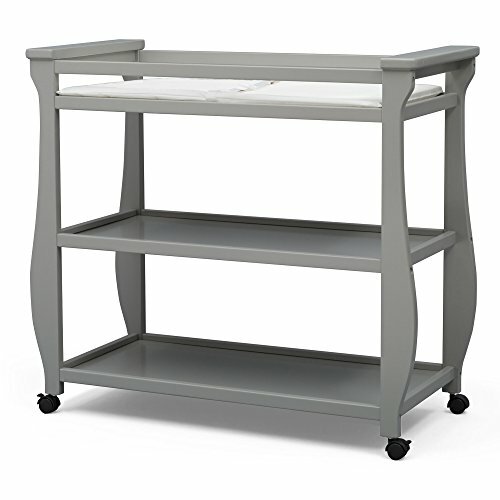 Outfitted with four wheels, this changing table can easily be moved from your bedroom to the nursery, even the living room-wherever you need a convenient changing station. Crafted from the best materials, this wooden changing table features a timeless sleigh-style silhouette that will never go out of style. Available in Grey, Bianca White and Dark Chocolate. Coordinates with other items in the Lancaster Collection from Delta Children. Delta Children was founded around the idea of making safe, high-quality nursery furniture affordable for all families. That's why all Delta Children changing tables are JPMA certified, and are rigorously tested to meet or exceed all industry safety standards.